How People in Lodi are Saving Lives All Over the World — Lodi Live! Think back to 2009. We were at the height of the recession and back then a lot of people were feeling pretty hopeless. Bear Creek Community Church saw what was happening and wanted to give people a way to feel inspired again. “Our thinking was, what would God have us do?” explained Ann Pacheco. She’s part of the senior leadership at Bear Creek and leads what is now known as Bear Creek Water. She’s really passionate about this program and excited to share it with others. “We were inspired and felt like we had to do something to help people. We thought, what’s the very least we can ask people that will do the very most amount of good. Well the least we can ask from people is what they throw away, right? So we decided to ask for aluminum cans we could recycle for money. So then if that’s the very least [cans], what’s the most those recycled cans can do? Is it give people food? Well no, because you can live longer without food than without water. So we decided the most we could do was to give people clean water.” And just like that, Bear Creek Water, a recycling program to fund wells all over the world, was born. When Bear Creek Community Church decided to start this program they had a few goals in mind: inspire people in Lodi, help children in need, and spread this program. Almost ten years later, they seem to have achieved their goals and are drilling an extra special well to celebrate. 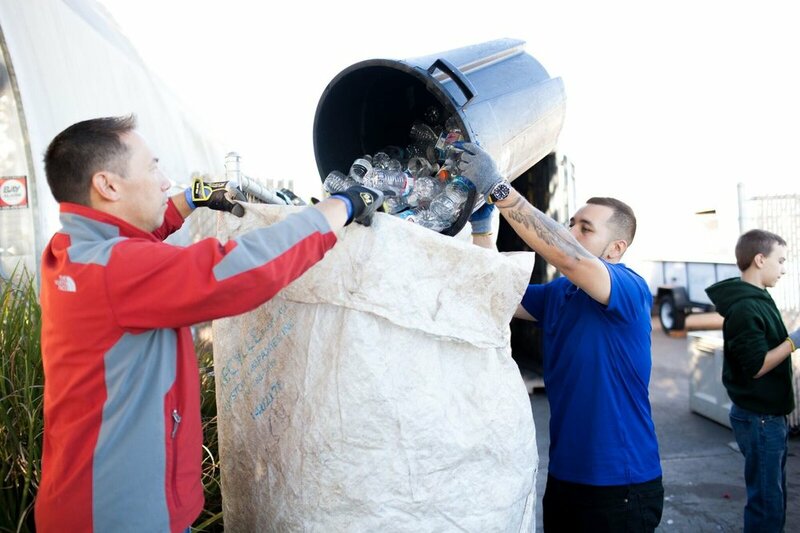 The program is super simple: Bear Creek Water collects plastic bottles and aluminum cans with California Redemption Value (CRV) and recycles them for money. They take that money and use it to fund wells all over the world. It started with just the Bear Creek congregation and has spread since then. Now 10-15 other businesses, schools, organizations and churches in Lodi are recycling with Bear Creek to drill more wells. When Bear Creek Water was established, the founders chose to work through the organization Living Water International partly because it allows them to choose where the wells they fund are drilled. Their goal is to drill wells which specifically benefit children when possible, and this allows them to do just that. They also like Living Water because it allows Bear Creek Water to put a plaque on each well and it sends them a report back about the well and who it benefits. “We receive testimonies, GPS coordinates, and statistics about the well. We have a report from every single well, which is awesome because it’s like, you made that happen! Why? Because you pick up recycling when you go for a walk and because you ask your friends and neighbors to give you their recycling. See that kid? You changed that kid’s life,” says Ann. The program is simple. It’s doable, costs almost no money, and is empowering. I mean, can you imagine how inspiring it must be to see the faces of the kids who now not only have access to clean drinking water, but also have clean water for self hygiene, plus aren’t forced to drop out of school because they have to walk miles each day to get water? How could Ann and her colleagues not feel passionate about Bear Creek Water? It’s no wonder this program is spreading all over. What started as a humble program back in 2009, of essentially collecting trash, has grown exponentially over the last 10 years. Other churches in the community have come on board and people inside the Bear Creek Congregation have told friends, families, and coworkers who all now donate their recyclable cans and bottles. Thanks to all of the support, Bear Creek is funding their 100th well this November! Bear Creek, and the people who have supported their program, have brought clean water to over 70,000 people. That’s like bringing clean water to the entire city of Lodi. Can you imagine if we didn’t have water, how different our lives would look? “Over 70,000 have benefitted from just Bear Creek Water, and over a 120,000 people now have clean water due to Bear Creek Water being duplicated in other churches in Northern California--we are calling these programs Recycle for Water.” explained Ann. “Imagine if the City of Lodi had no clean water. We would have disease, sickness, unemployment, and no education for our entire city.” These are all of the problems solved through clean water. When Bear Creek Church started this program they created a manual so other churches and institutions could bring the program to their communities. Because they put this together, and because the program is so simple with such a huge payoff, churches across California are starting their own Recycle for Water program. Westgate Church in San Jose will actually be joining forces with Bear Creek on their 100th well. It will be the 100th well funded by Bear Creek and the 50th well funded by the Westgate Church. GracePoint Church in Lodi now also has a thriving Recycle for Water program. “Our goal has always been for Recycle for Water to spread to more organizations and churches all over California. Just think how many lives could be saved and changed forever.” What a big difference one idea can make. If you’re feeling inspired by what Bear Creek Water is doing and are interested in starting your own Recycle for Water program, contact Bear Creek Water. You can also join their annual fundraiser, Run for Water, in April.